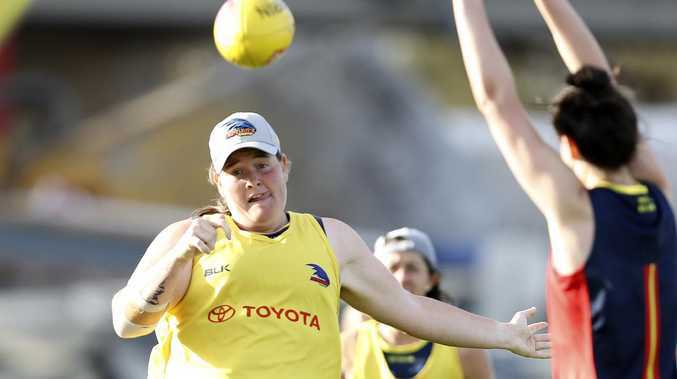 Adelaide AFLW cult hero Sarah Perkins has had an off-season to remember but returns to the Crows prepared to play any role under new coach Matthew Clarke. Perkins, 25, was Hawthorn's leading goal kicker as the Hawks won their first Victorian women's league over winter and has renewed confidence after the Crows' disappointing second season in the AFLW. Her first was a charm: after missing out on the first AFLW draft she became one of the Crows' historic first players to take out the first national women's league championship. The fans loved her for her long kicking and enthusiastic celebration of goals. But Perkins was more subdued the second season. The team struggled with its best player, Erin Phillips, carrying an injury and Perkins received much more attention. It led to coach Bec Goddard shifting her into the midfield to help her have an impact and not get cut out of games in the goal square. This year, under new coach Matthew Clarke, Perkins will have an open mind. She played as a high half-forward with the Hawks but will play wherever she's required in the third AFLW season. "I'm not sure - I'm just happy whatever role for the team," Perkins said. "I guess we play a team sport and the ultimate goal we want is team success. "Whether that's up forward or another role I really don't know. 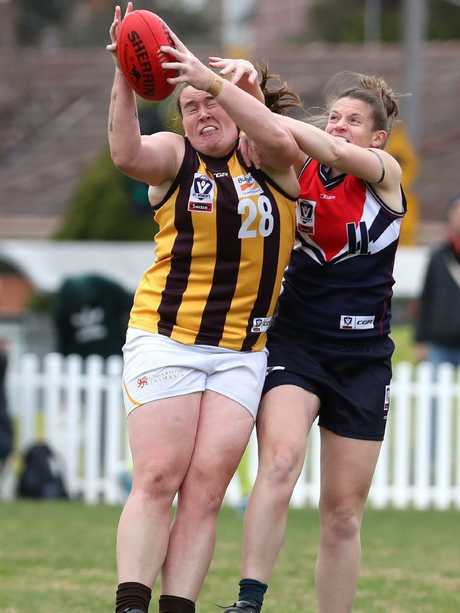 Sarah Perkins in action for Hawthorn in the VLFW in August. "At the moment I'm just excited for Round 1. "To be out there with the girls would be the ultimate goal - wherever that is. "I couldn't care less if I was sitting on the bench. "We had whirlwind season one, then we had lots of pressure going into season two and we've just gone away, refocused and come back with really positive minds." Perkins expected the competition to continue to evolve in the third season of AFLW. There will be preliminary finals this year - as opposed to just a grand final - and the league has expanded. "Obviously we've got two new teams in North Melbourne and Geelong," Perkins said. "It's exciting. "Everyone has worked so hard to improve their skills and continue to get better. "For me, I think skills are going to get better again and I know all of us, across the board, want to play exciting footy."